AILÍN: British or Irish or both? British or Irish or both? It's one of the struggles which some of us in Northern Ireland exist with. What is our citizenship? 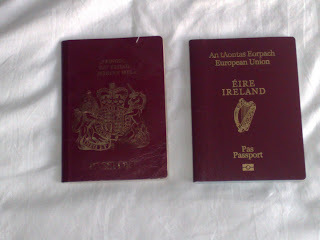 I hold passports for both jurisdictions..........I feel 100% Irish but with a hint of Britishness. I am not sure my Irish identity can been summed up by what happens south of the border. Anyone born in Northern Ireland, as part of the Good Friday Agreement has a right to hold a passport of the UK, Ireland or both. My right to Irish citizenship pre-dates this agreement as my grandparents were born before Ireland was divided. Our little island's history is complex and a short blog post by me wont be enough to deal with the issues. I personnally feel the division of this island remains one of the British Government's biggest foreign policy failures. I understand the strength of feeling which some people have in this country for Britain and her traditions but I also believe that this has been reinforced by partition. 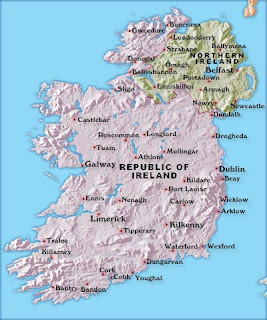 Will Ireland always be divided? I really do doubt it, Unionists believe our future is inextricably linked to the UK, but I feel that with nationalist movements gaining momentum in Scotland and Wales it is only a matter of time until the issue becomes one of not if but when.